The War of the tablets is back. In Part-I, we talked about the big daddies of the tablet market and this time around, we are going to focus on the potential game changers in the tablet market. Of course, these are the brands which do not hold the lion's share in the tablet market like Apple and Samsung do. But they are making the right moves. These warriors have the capacity and the capability to turn the tables if they hit the right chords with consumers. Some of these tablets are already launched, while the arrival of others is eagerly awaited. The HP TouchPad is already available in the USA for pre-order and will hit the shelves in July. The India launch date has not been confirmed but it is expected to arrive in India in Q3, 2011. Additionally, reports of a 3G version of the tablet and a 7-inch tablet by HP are also doing the rounds. The tablet has HP's webOS 3.0 operating system (which the company believes is unmatched), runs on a 1.2 GHz Scorpion dual-core processor, Qualcomm APQ8060 Snapdragon chipset and has a 9.7 inch capacitive touchscreen with 16 million colours and 768 x 1024 pixels resolution. It has 1GB of RAM and comes with 16GB or 32GB of in built memory. The device has a front facing 1.3 mega pixel camera for video calling but unlike its competitors it has no rear camera. Details about the battery life were not provided but the tablet will be available in black colour. Price The price and launch date of the HP TouchPad in India is not available as of now although it is priced in the USA at $499.99 and $599.99 for the 16GB and the 32GB models respectively. What a wonderful day to write about Motorola: the company has just announced the launch of their Motorola Xoom tablets in India. How it will fare in the war is too early to predict nevertheless, let us check out the arsenal it's loaded with. 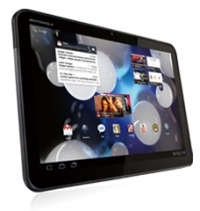 Motorola Xoom has the Android 3.0 (Honeycomb) operating system (upgradable to 3.1), a 10.1-inch capacitive touchscreen display with 1280 x 800 pixel resolution and runs on a 1 GHz NVIDIA Tegra 2 AP20H dual-core processor. It has 1GB of RAM and comes with up to 32 GB of on-board memory and a micsoSD card slot for further expansion. The tablet comes in a Wi-Fi only and a Wi-Fi+3G model and has a 5 mega pixel auto-focus camera with dual-LED flash and digital zoom. It can record high definition videos (1080p) at 30fps and also has a 2 mega pixel secondary camera for video calling. Additionally, it has a HDMI port, GPS with A-GPS support on all models and a Flash-enabled web browser. Motorola claims the tablet will give 10 hours of video playback and 3.3 days of music playback. Dimensions Height: 249.1mm, width: 167.8mm, depth: 12.9mm and weight 700grams for the Wi-Fi only model while the Wi-Fi+3G model weighs a little more at 730 grams. The Wi-Fi only model is priced at Rs 31,999 and the Wi-Fi+3G model is priced at Rs 38,999 on shopping sites like Letsbuy.com and HomeShop18.com in India. The Singapore based Creative Technology Ltd. has also launched their tablets in India called Creative Ziio. The tablets have Android based operating systems but unfortunately not Honeycomb. Creative has launched a 7 inch (touchscreen display with 16.8million colours and 1024 x 600 pixels resolution) and a 10 inch (touchscreen display with 262k colours and 480 x 800 pixels resolution) tablet and both have the Android 2.2 OS and run on ZiiLABS ZMS-08 HD Media-Rich Applications Processors. Both the models have 512MB of RAM and come in 8GB and 16GB of internal memory that is expandable up to 32GB with the help of a microSD and a SD card respectively. Both have a front facing VGA camera and have an HDMI port. 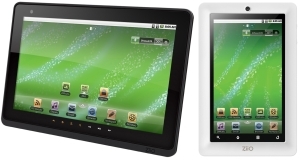 The 10-inch tablet is available in black colour while the 7-inch tablet is available in white. All in all, nothing too great about the Creative tablets but their adequate pricing does give them a fighting chance. The tablets are available at a price of Rs 19,999 and Rs 16,499 for the 10 inch and the 7 inch tablets at online shopping sites Letsbuy.com and Homeshop18.com. Don't worry; it's not a character from the latest Transformers movie, although it might as well be. The latest tablet from ASUS is code-named Eee Pad Transformer due to an optional docking system which transforms it into a notebook and even extends its battery life further. 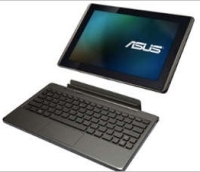 Asus Transformer has the Android 3.0 (Honeycomb) OS (upgradable to 3.1) integrated with Asus's Waveshare user interface, a 10.1 inch LCD capacitive touchscreen with 1280 x 800 pixels resolution and runs on a 1GHz NVIDIA Tegra 2 AP20H Dual Core processor. It has 1GB of RAM and an internal memory of 16/32GB which is expandable further with the help of a microSD card. The device sports a 5 mega pixel autofocus camera at the rear and a front facing 1.2 mega pixel camera for video calling. Asus claims a battery life of 9.5 hours which can be further extended up to 16 hours with the help of the optional keyboard dock. The tablet will be available in black colour. The prices in India are not yet available but the TF101-A1 16 GB sells for $399 and TF101-B1 32 GB for $499 internationally. The tablet will be hitting the Indian market in the last week of July according to The Mobile Indian. Sony is going to venture in the tablet market for the first time this year but the company has still managed to create a buzz for themselves. After a never ending list of almost identical tablets from various companies, Sony promises their pair of tablets, the S1 and S2 are going to be different. Although there is not much information available about the specifications, we have integrated what information we were able to collect. Both the tablets will have the Android 3.0 (Honeycomb) operating system. 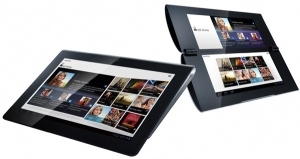 The Sony S1 is a 9.4 inch touchscreen display (with 1280 x 800 pixels resolution) tablet, which looks more like a folded magazine than a tablet while the Sony S2 is a folding slate with two 5.5 inch touchscreen displays (with 1024 x 480 pixels resolution). Both the tablets have a Tegra 2 chipset. The S1 will have a front facing and a rear camera and a customized "Quick and Smooth" touch panel user interface with "Swift" web browser, while the S2 will also have a rear camera but no front facing camera and it will have a book style Custom user interface. Both the tablets are PlayStation Certified and are Wi-Fi and 3G/4G compatible according to Sony. Although India does not have an official price or launch date, Sony has officially confirmed that they are going to launch S1 and S2 on September, 2011, in the UK according to the FoneArena. The tablets can be priced at $599 and $699 in the international market for the S1 and S2 respectively. That's all for today, but stay tuned for the grand finale where we will talk about the underdogs, the foreigners and our very own Indian babies.